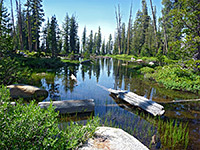 The three Sunrise Lakes sit beneath the northern slopes of Sunrise Mountain, at elevations between 9,166 and 9,427 feet, surrounded by smooth granite hillsides and patches of woodland, part of a typical Yosemite landscape also including meadows, wildflowers, white boulders and small streams. The lakes are reached by the Sunrise Trail between Tenaya Lake and the John Muir Trail near the Sunrise High Sierra Camp, and all may be seen via a hike of 3.7 miles, initially across fairly level, wooded land at the upper end of Tenaya Canyon, but then up a steep hillside, gaining 1,000 feet over a short distance, to a saddle, and finally over gently sloping land at the foot of Sunrise Mountain. The round trip makes for a relatively easy half day hike, though many people here are backpackers, staying overnight either by the lakes, or at the High Sierra Camp 1.5 miles further. The lakes are not quite as spectacular as others such as Cathedral Lakes or May Lake, since the surrounding peaks are less dramatic, but the scenery is still very photogenic. Sunrise Lakes (and Clouds Rest) topographic map. 14 views along the trail to Sunrise Lakes. The trailhead for the Sunrise Lakes is also used for hikes to various other places including Clouds Rest and Yosemite Valley, as well as by people just visiting Tenaya Lake, so the place soon fills up on busy summer mornings, but the roadsides nearby are wide enough for even large vehicles to be parked in safety. 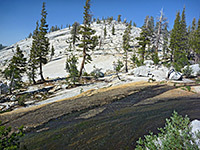 The path enters the woods, skirts the edge of a meadow and crosses the outlet stream of Tenaya Lake, via stepping stones during the drier months of late summer, but earlier in the season the flow is much greater and wading is necessary. After two junctions, with paths east and west, the Sunrise Trail continues through quite thick forest, past a pond and many clumps of boulders while following close to a small stream, rising slightly after a while to an open area which gives the first long distance views, of canyons and mountains to the southwest. On the far side, the ground stays fairly level and wooded for the next mile, until, soon after crossing a creek, a granite cliff face comes into view to the east and the path begins to climb sharply, still through shady trees at first then out onto an open granite slope. The forest returns after many steep switchbacks, the gradient lessens and the trail comes up to a flat saddle, and a junction with the Forsyth Trail; a sign gives continuation distances as Sunrise High Sierra Camp 2.5 miles, Yosemite Valley (via the John Muir Trail) 12.2 miles. Turning left, the next section of the Sunrise Trail runs along a largely treeless ridge, dotted with many white boulders, then drops down slightly to a shady coppice beside the first of the three Sunrise Lakes, bordered by granite cliffs to the southeast and trees on the other sides. 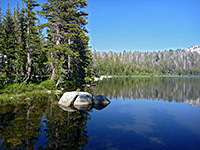 Like most lakes in Yosemite, mosquitoes are abundant hereabouts in summer. The trail curves around the west edge and crosses the exit stream, which forms a pretty pond on the far side, just before a big descent down the hillside beyond. Past the first lake, the ground rises another 200 feet and becomes more sparsely wooded, sloping up gently to the third (upper) lake, which is enclosed by grass and mudflats, but still with rocky slopes beyond, and the path ascends a ravine up the hillside to the south, to the junction with the John Muir Trail, from where Sunrise High Sierra Camp is half a mile away to the north. The second, or middle lake lies 500 feet north of the path, reachable by an easy off-trail walk down a slope, arriving at the overgrown shoreline near the entry stream (the exit from lake three), which flows down smooth granite slopes, forming sheet cascades and shallow pools.